UK CHART POSITION #2 . . . US CHART POSITION #1 . . .
k ronomyth 6.0: CARIBOU AT FOUR. Granted, this is better than the aforementioned Elton John album, but not a whole lot better. 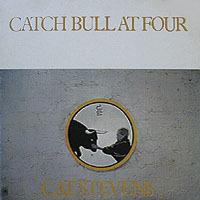 After two brilliant albums, cracks were starting to show, such as restlessness and a sense that Cat was on auto-cruise. 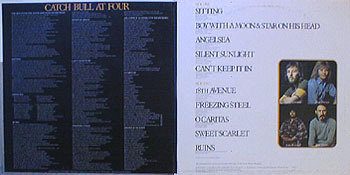 Historically, I listen to this album for “Sitting” and “Can’t Keep It In” rather than sitting through the whole thing. When I do give it a full forty minutes, I wonder where the infectious melodies went, why Alun Davies isn’t given more to do, how this ever sold a million copies. There’s usually one album in an artist’s catalog that, logic tells me, should be better than it is, and so I pore over it looking for something that isn’t there. Caribou, Tales From Topographic Oceans, King Crimson’s Islands come to mind, and to this day the only convert I’ve encountered is ELO’s Face The Music. For me, Bull is the anomalous bump where I expected only smoothness. The limited edition original master recording from 2000 did bring a little more clarity and color into the music, though here again the repackaging could have been better and, surely, the planets wouldn’t shift out of their heavenly alignment and send meteors hurling toward our habitable kingdom if someone added “Crab Dance” as a bonus track. Mind you, if Bull is the plain-faced stepchild, Foreigner is the back-alley abortion, so don’t read too much into my dyspepsia. 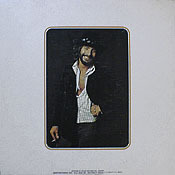 The minutes pass pleasantly enough on songs like “Boy With A Moon & Star On His Head,” “Angelsea” and “18th Avenue;” it’s just that they don’t sparkle with the irrepressible energy and invention of Teaser and Tillerman. 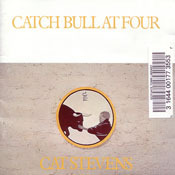 Of interest, Catch Bull At Four is the first album to feature Jean Roussel, who would stick with Stevens for the remainder of his albums.